Many people believe that organic agriculture is a solution for various problems related to food production. Organic agriculture is supposed to produce healthier products, does not pollute the environment, improves the fertility of soils, saves fossil fuels and enables high biodiversity. 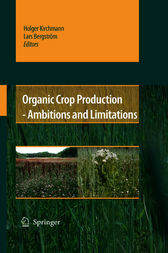 This book has been written to provide scientifically based information on organic agriculture such as crop yields, food safety, nutrient use efficiency, leaching, long-term sustainability, greenhouse gas emissions and energy aspects. A number of scientists working with questions related to organic agriculture were invited to present the most recent research and to address critical issues. An unbiased selection of literature, facts rather than standpoints, and scientifically-based examinations instead of wishful thinking will help the reader be aware of difficulties involved with organic agriculture. Organic agriculture, which originates from philosophies of nature, has often outlined key goals to reach long-term sustainability but practical solutions are lacking. The central tasks of agriculture - to produce sufficient food of high quality without harmful effects on the environment - seem to be difficult to achieve through exclusively applying organic principles ruling out many valuable possibilities and solutions.